Directed by Daniel Stamm. Starring Patrick Fabian, Ashley Bell, Iris Bahr. it, mainly in the last act, are SO BAD that somehow they manage to ruin everything and eventually plunge this film into the “pit of catastrophe”, despite some good performances ere and there. you’re planning to waste… erm.. sorry, I meant “to spend”, 90 minutes of your precious life watching it, then stop reading right now. 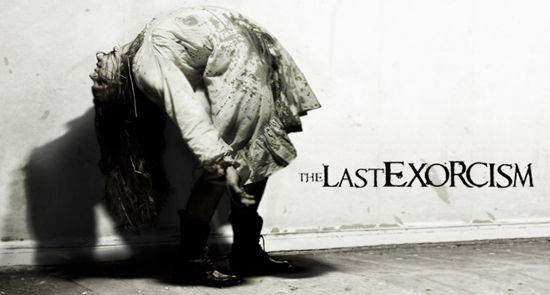 “The last Exorcism” is actually a clever spin on the usual exorcist fare, but more than that it is the latest entry into that much exhausted “found footage” genre started off by Blair Witch 12 years ago (My God, has it been that long already?) . The film is produced by Eli Roth who in the last few years has created a name for himself, with titles like Cabin Fever and the infamous Hostel, for pushing the boundaries of taste and gore. This time the “shock factor” is kept down to a minimum, which is what makes the first part of the film quite intriguing and succesful. Because of its premise the film manages to put to rest right from the start the ever-ending question of a type of mockumentary like this (Blair Witch Project, REC, Cloverfield and Paranormal Activity): why would the characters keep on filming, despite everything that’s happening? Would they actually been filming that instead of running away or saving their butts? It’s the sort of thing that usually annoys the hell out of me and pushes our suspension of disbelieve to absurd levels. In this case the plot requires the cameraman to actually film everything that’s going on. A disillusioned evangelical minister, after years of performing exorcisms, decides to be filmed for a documentary exposing the fraud of exorcisms, proving that they do not really exist and it’s actually all in the heads of the people who think they are possessed… So far so good. The whole beginning of the film actually made me hope for something quite good: a new and intriguing take on the seen-before theme of exorcism. supposed to be real, or just a cheap heavy handled, tricksy, manipulative piece which doesn’t really care for its integrity but just wants to make me jump every time somebody goes “booo” on the screen? It is a real shame, because I really thought this was working up to a certain point. And finally, a couple of words about the ending of the film, which is one of the most awful ending I can ever remember. It is so bad that it actually makes you forget all the good things you’ve seen up until that point. I haven’t yet met a single person or read a single review that hasn’t actually mention how terrible it is!! How can that happen? Either they got cold feet and changed their mind at the last moment or they must be really stupid to even think for a moment that the audience could buy into something so stupid. They wanted to do a “Rosmary’s Baby” type of twist, without realizing that Rosmary’s Baby actually builds up for two hours towards the revelation. This one feels just like a last-minute turn. In a way “The last Exorcism” is the type of film that doesn’t really work for any kind of audience: the avid horror fans will get disappointed by the lack of “action” and “gore” (the marketing campaign is incredibly misleading!! ), the people who like good storytelling and good twists (the Sixth sense fans) will hate its clunky turn and awful ending. All the others people who never really liked horror films will find no redeeming feature in this either. The DVD and BlueRay has just come out and it’s packed with Special Features including 3 types of commentary tracks. It will be interesting to know if we learn anything more to explain how such bad ending was conceived. If anyone has listen to those commentaries or seen the many special features available, please let me know. I am not giving a single extra dime to Ely Roth.